Film Width: Up to 27"
Variable Speed: Up to 10 ft./min. This new and improved GBC Pinnacle 27 EZload roll laminator delivers a perfect, high quality lamination every time. This laminator is can laminate documents up to 3mil thick and up to 27" wide. With a laminating speed of up to 10 feet per minute, the GBC Pinnacle 27 EZload is perfect for large-scale jobs that need professional results. Utilizing heat roller technology, expect the most consistent quality lamination with the highest clarity, even on long runs. This laminator has a patented EZload technology that makes film loading foolproof using color coded end caps to ensure film is loaded correctly (regardless of user experience). Plus, with an array of improved user friendly features, laminating posters, signs, flashcards,tags and more up to 27" wide is easier than ever. This GBC Pinnacle 27 Ezload 27" Thermal Roll Laminator is backed by a one year warranty. EZload film loading technology makes film loading fast and easy, preventing film wraps and other hassles. Improved open design creates added space during film loading. Auto standby and shut off saves power. Edge guide ensures perfect alignment for difficult projects. Extended rear exit reduces film wraps. Footage counter helps track film usage. Auto reverse now works even with the heat shield to clear jams with ease. Compatable with a variety of Nap I and Nap II films. Popular films are: 3000004, 3126061, 3000024, 3125410, 3125702. I bought this for donation to our local school for the teachers. Getting lots of use. Make a teachers day by giving them a tool the can really use. Pros: Sleek Design; Sturdy; Unique; Improves Organization This is such an excellent invention for anyone who uses chalk in their field! For something that is called EzLoad it is actually harder to load than I would like. I do like the fact that I can't load it backwards though. One of the teachers at our school loaded the last machine wrong and ruined it. Overall this machine has been easy to use and is a good choice for our school. I would recommend it. Introducing the Pinnacle 27 EzLoad Laminator with fool proof film loading so nor more film wrap ups and costly service calls. It only loads one way. It also features AccuTherm heating technology for fast warm-ups in under 10 minutes and superior performance – even on long runs. The Pinnacle 27 EzLoad accepts both Nap-Lam I and Ii films, up to 27 inches wide and 3 millimeters thick, user friendly control panel, trackable film usage, built in trimmer. The Pinnacle 27 EzLoad Laminator from GBC. Transcript: Congratulations on your purchase of the GBC Pinnacle 27 EZLoad. Proper usage and care will give you years of trouble-free lamination. Congratulations on your purchase of the GBC Pinnacle 27 EZLoad. Proper usage and care will give you years of trouble-free lamination. Remove the Pinnacle from its package and place it on a stable surface that supports 150 pounds. Position it to allow film to exit freely. Do not place the Pinnacle near heat or cold sources as they can affect the quality of lamination and warm-up time. Review your Owner's Manual to learn of potential hazards from improper operations. The heat shoes and roller are hot when the Pinnacle is on. The points where they meet to laminate is called the nip point. Keep loose clothing, long hair and jewelry away from the nip point at all times. Plug the Pinnacle into any standard sized outlet that is not being used for any other heavy-duty equipment. Your Pinnacle comes with two preloaded test rolls of 1.5 mil film for setup and training. Turn the Pinnacle on using the main power switch on the back. This allows you to conveniently turn it on and off at the control panel. Check that the film rolls are locked and that the heat shield is closed. If the feed table is not locked in the proper position, the rollers will not turn. The Pinnacle runs both Nap Land 1 and 2 film from 1 mil to 3 mils thick. The temperature setting automatically defaults to Nap Land 1. Select Nap Land 2 when running Nap 2 film. Actual temperature is displayed until the setting is reached, then the display becomes a footage counter. The Pinnacle takes only 6 to 9 minutes to warm up. The green ready lamp lights and sounds an audible tone when it's ready to laminate. Check the speed guide printed on the feed table and set the speed using the dial. 1 and 1.5 mil film can run at any speeds from 1 to 10. 3 mil films should only be running at speeds from 1 to 5. Position your materials on the feed tables and press Run. Gently guide your materials into the nip point of the heat rollers. Do not try to reposition the items after the rollers have begun to pull your items. You may place additional items onto the feed table without stopping and starting the Pinnacle. Once all of the items have completely exited, press Stop. To remove your items, hold the film away from the Pinnacle, press the cutter and slide it across the film. Although the blade is covered when not in use, it's very sharp, keep fingers clear of the blade. For safety, only use the Cutter from behind the Pinnacle, do not reach over it as loose clothing can become caught in the rollers. You may now shut off the Pinnacle or leave it on, after 2 hours of inactivity, it will automatically shut off. This feature can easily be disengaged for all day use by simply moving the sleep mode switch to the off position. Good, consistent operation depends on combining proper heat, tension and speed. Thicker items and films, items that are dark or have full ink coverage need to run at slower speeds. Running them too fast may cause peeling or bubbling. Thinner items like tissue and copy paper should be run at faster speeds. Running them too slowly can cause wrinkling or cloudiness. To be sure of proper speed for your item, run a test piece of the same or similar material and make speed adjustments as necessary. Long lamination runs of more than 30 minutes might require a slower speed setting. To avoid heat line, always wait until the materials have completely exited the back before pressing Stop. Abrasive or metal objects such as staples and paper clips may damage the Pinnacle, so remove them before laminating. Any item that is not easily pulled through the rollers is probably too thick. Call your GBC authorized service technician for repair and service. Select a few key people to be responsible for advanced operations such as film loading, clearing jams, cleaning and maintenance. The easy load technology on the Pinnacle 27 EZLoad ensures fast, easy and mistake-proof film loading each time. Each roll is designed to install only one way to prevent incorrect loading. Always run top and bottom rolls of the same width. We will show you two methods for loading film. One method for replacing film rolls is to use the existing film to help feed the new film through. This method works best when the Pinnacle is heated. Use extreme caution and avoid contact with the heat sources. Preheat the Pinnacle until the ready lamp illuminates. Remove the feed table. Cut the remaining top and bottom films between the rolls and heat shoe. Remove the heat shield. Remove the bottom film roll by unlocking the latches and lifting the roll out of the cradle. Place the new film into the bottom cradle and close the latches. Unroll enough film from the new bottom roll to tack to the existing film on the heat shoe leaving a little slack. Replace the feed table. Unlatch the film and remove the top roll of film and replace it with a new roll. Lock the film into place. Unroll the film, tuck it under the idler bar onto the existing film on the heat shoe. Replace the heat shield. Turn the Pinnacle on, select temperature setting and let it warm up. Then set the dial to one and press Run. To ensure proper feeding, both the old and the new film must advance at the same time; any separation of the films will require repositioning of the film over the heat shoe. After the newly threaded film has completely exited and the output is clear, press Stop and now you are ready to laminate. The second method of film loading uses a threading card. Remove the feed table and the heat shield. Unroll enough film from the top roll and drape under the idler bar and over the heat shoe. Lift the bottom film up and over the heat shoe. At this point the bottom and top film will begin to adhere to form one film. Reinstall the feed table and heat shield. Turn the machine on. Then set the dial to one, press Run and slide the threading card between the feed table and the bottom film gently push the card into the nip point. The card should now guide both rolls of film into the heat rollers. As the rollers turn, be sure that the leading edge of the threading card enters the back rollers and properly exits the Pinnacle. Once the threading card has exited, push Stop. Your film is now installed. Film jams may occur if the film exit is blocked, causing the film to wrap around the cool rollers. To clear a jam, remove the feed table and cut the top and bottom film. Replace the feed table and turn on the Pinnacle. Press reverse while gently pulling the jammed film towards you being careful not to touch the heat shoe. After the jam is clear, rethread the Pinnacle using a threading card. The only maintenance required on the Pinnacle is the cleaning of the heat shoe with each film change. This procedure is performed while the Pinnacle is hot, so use extreme caution. Preheat the Pinnacle until the ready lamp illuminates. Cut the top and bottom film. Press and hold the Reverse Button while gently pulling the film toward you. Clean the top and bottom heat shoes with a soft cloth and install the feed table and heat shield. Rethread Pinnacle using the thread card method. For complete Maintenance Coverage, repair and service, contact GBC Full Circle Service at 1-800-541-0094. 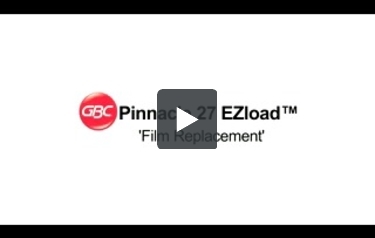 The Pinnacle 27 EZload uses easy-load technology to ensure fast, easy and error-free film loading. Using color-coded plugs on each end of the roll, this method allows you to quickly and correctly drop the rolls into the laminator, therefore, eliminating the chance of loading the film backwards. Once the new rolls of film are locked into place, you’ll then need to thread the film through the laminator. There are two ways to thread the film – using either existing film left on the heat shoe after cutting the film from the rolls or use a threading card. So when loading film into the laminator where there is no existing film over the heat shoe, you’ll need to use the threading card method. First, let’s explore the method using the existing film for threading. This method works best when the laminator is warmed up. Pre-heat the laminator until the ready light illuminates. Remove the feed table by first disengaging the locks at both ends. The laminator will automatically power off once the feed table is removed. Without removing the heat shoe, cut the remaining top and bottom films between the rolls and the heat shoe. You now have film remaining intact on the heat shoe detached from both the top and bottom rollers. Remove the heat shield. Remove the bottom film roll by unlocking the latches and EZload film cradles on both ends of the laminator and let the roll out of the cradle. Now remove the top roll of film in the same way. Place a new roll of film into the cradles by matching the color of each end cap to the color indicated near the cradles. Close the latches. Unroll enough film from the bottom roll to tack on to the existing film on the heat shoe. Replace the top roll following the same steps as described earlier. Now, unroll enough film from the top roll of film to tuck under the idler bar onto the heat shoe over the existing film. Replace the feed table and re-engage the locks on both ends. Replace the heat shield. Turn the Pinnacle on. Select the proper film type by pressing the nap one or nap two button and allow the machine to warm up. When the ready light illuminates or the audible alert sounds, set the dial to one and press ‘Run.’ To ensure proper feeding, both the old and the new films must advance at the same time. Any separation between the films will require repositioning of the film over the heat shoe. After the newly threaded film has completely exited from the rear and the output is clear, press ‘Stop.’ Trim off the excess film from the rear with the built-in trimmer. Now, you’re ready to laminate. Let’s now explore the other method of film threading by using a threading card that is enclosed inside the packaging. This method also works best when the laminator is pre-heated. Using extreme caution as the heat shoe is hot, remove the feed table and heat shield. Replace the top roll following the same steps as described earlier. Replace the bottom roll but do not unroll any film onto the heat shoe after the shaft is snapped back into place. Unroll enough film from the top roll to tuck under the idler bar and drape over the heat shoe. Now, lift the bottom film up and drape over the top film on the heat shoe. At this point, the bottom and the top films will begin to adhere forming one film. Install the feed table and the heat shield. Turn the machine back on and select the proper film type and, again, allow the machine to warm up. Set the dial to one and press ‘Run.’ Slide the threading card into the laminator and allow it to feed completely through. Once the card exits from the rear and the output is clear, push ‘Stop.’ Trim off the excess film from the rear with the built-in trimmer. Your film is now installed. One of the most difficult parts of owning a roll laminator can be installing the laminating film. However, loading film is totally easy when you use the GBC Pinnacle 27. This device utilizes GBC EZ Load film to make installation easier than ever before. But what else can this machine do? Let's take a look at its strengths and weaknesses and find out. 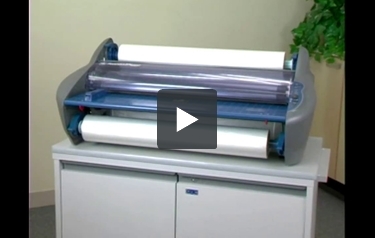 The Pinnacle 27 is one of the easiest roll laminators to load. To load it, you must use GBC EZ Load film that simply snaps into your device. It's totally foolproof and impossible to load incorrectly. This will help you save a lot of time. This machine accepts both Nap Lam I and II EZ Load cartridges. These films range in thickness from 1.2 to 3 mil. The Pinnacle 27 has a feed opening that's 27 inches wide. It's perfect for both letter- and legal-sized documents, as well as larger items such as banners. If you're in a hurry, you won't need to wait long for the Pinnacle 27 to be ready to go. It can warm up in less than 10 minutes so you can get to work right away. The Pinnacle 27 has a footage counter that keeps track of how much you've laminated. This can help you keep track of how much laminating film you have left. This machine has a built-in horizontal trimmer so you can cut away excess adhesive as well as free your document from the machine. This means you don't have to place sharp objects near the machine's rollers that could possibly end up doing some damage. The film you use can have a maximum thickness of 3 mil. Thus, this isn't a good machine to use if your document requires more protection. The Pinnacle 27 doesn't offer cold lamination. You'll need to use a different machine if you want to laminate items that are thermally sensitive such as color copies and some photographs. This laminator is really large and measures 35.5" (width) x 21" (length) x 14.25" (length). Finally, this product has a one-year warranty so getting it fixed (or replaced) will be easy and won't drain your wallet. The GBC Pinnacle 27 does have a couple of shortcomings (particularly its lack of a cold setting), but overall, this is one of the better roll laminators you can buy. You love that the film is easy to install and that you'll get professional-looking results in minutes. It's also great that it has an integrated trimmer and footage counter. If you need a feature-packed laminator that loads easily, the Pinnacle 27 is worth your consideration. Core Diameter 1" and 2.25" 1"
Dimensions 27" x 13" x 18" 35" (W) x 21" (D) x 14" (H) 42" x 15" x 24 1/2" 42" x 15" x 24 1/2" 18.11" x 11.14" x 16.92"
I don't see where you turn on the auto shutoff on the back. Thank you for your question. For the GBC Pinnacle 27 EZ Load 27" Roll Laminator the auto shutoff selector appears to be on the inside right panel ( Figure 11 in the user manual) . If you need guidance in locating the switch GBC technical support is available at 1-800-944-4573. Thank you for your question. There can be several things that can cause bubbling. Some of the issues that can cause bubbling include; not getting hot enough to properly activate the adhesive, the roll of laminate is too loose and it is not getting the proper tension in the film, The laminate is thicker than the machine is able to process. GBC would be able to provide support for their machine. 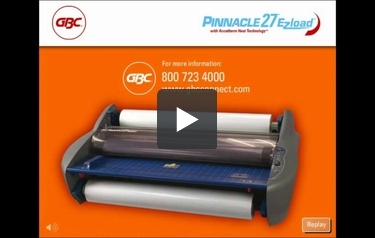 The GBC Pinnacle 27 EZ Load 27" Roll Laminator carries a 1 year manufacturer's warranty. GBC's tech support phone # is 1-800-790-7787 . After warmup, you put in a page to be laminated. The Pinnacle 27 ezload laminates about 7 seconds and the power shuts off and the machine gives an ER 1 code. What causes this? To address technical issues the best first step is to contact the manufacturers technical support department. The manufacturer is GBC and their phone number is 1/800-790-7787 .